The IronPigs mascots, Fefe (left) and Ferrous entertain the crowd before the game. 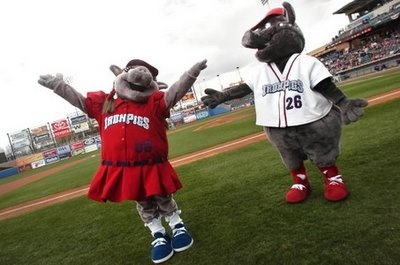 We continue our minor league baseball mascot tour with Ferrous and Fefe of the Lehigh Valley IronPigs. We spoke to the people under the suits, Kevin Killion and Sarah Kleppinger. Both have been with the team for 10 seasons. Here’s a look Ferrous and Fefe.